Okay, this officially qualifies as beating a (walking) dead horse. AMC Networks confirmed this week during a quarterly earnings call that the company is working on developing yet another spinoff to its cash cow series The Walking Dead. Few additional details were offered, but this series would stand in addition to the original The Walking Dead and its first spinoff Fear the Walking Dead. It would also apparently be unrelated to the trilogy of TV movies AMC is developing in order to keep Andrew Lincoln’s Rick Grimes as part of the TWD universe. 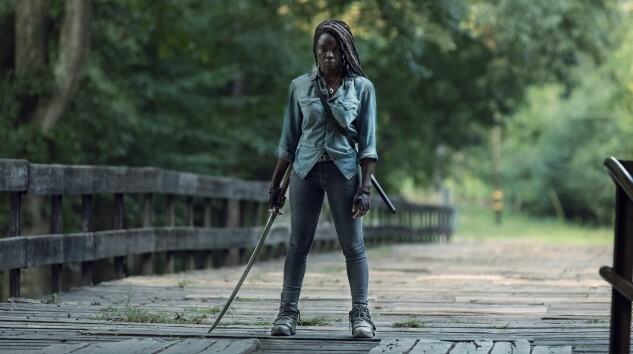 After Danai Gurira’s Michonne departs the show in season 10, those movies might well include her as well. Suffice to say, this is truly Walking Dead overload. On the earnings call, COO Ed Carroll said the third series was in “active development,” but declined to say whether it would also be on AMC, or on a streaming service such as Hulu, where AMC has a distribution agreement. We have to question just how healthy the appetite truly is for a third Walking Dead show. The original has seen its ratings drop precipitously over the last few years, losing its ”#1 show on TV” status to This is Us, even thought TWD remains the #1 rated show on cable. Still, its numbers are in what seems to be a perpetual slide at this point. The last thing you’d be expecting is another brand new show set in the same universe, particularly after Fear the Walking Dead already proved that arguably superior storytelling doesn’t translate to huge ratings on a zombie spinoff. What aspect of this zombie apocalypse remains unexplored at this point, anyway? For now, we’re in the dark in terms of what form this third series will take, but you can probably expect it to be considerably more conservative in terms of budget than either TWD or Fear. We’ll bring you more information as it trickles out from the AMC press corps.